I received “Mr. Froggy” from Julie (along with an EXTRA!!) only days after my initial email contact with her. I am truly astounded by her generosity and thoughtfulness in sending this to us so quickly. And the fact that she paid for the shipping and didn’t charge me a penny is remarkable. I have no words. Not everyone can help a family at no charge. If you find one of our lost lovies posted here, please don’t think that your help is not wanted if you ask for payment and/or shipping charges. 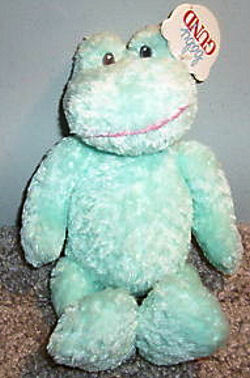 We are in need of finding Baby Gund Jiggles Frog, item number 5767, which is discontinued. We lost “Mr. Froggy” on a trip to North Carolina. Our son took him everywhere. We found one that was recently sold on eBay and were very frustrated that we had just missed the bidding on it. Do you have one, or would you be able to locate one?